Dozens of people funneled into HUB 302 emanating a palpable excitement. 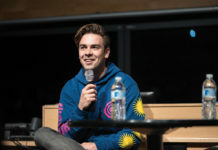 The event was hosted by the Undocumented Student Programs and received sponsoring from a wide range of campus groups and organizations, including the Global Issues Forum and LGBTQ Resource Center. As people filled in columns of seats and waited as coordinators prepped the microphones on stage, you could tell the anxiousness was rising by the minute. People bonded with her sassy and quick-witted television persona, sympathized with her wonderful story of resilience and now they were getting to see her speak in person. A huge PowerPoint was plastered to the west of the seats, which showcased the cover of her book. When she finally stepped onto the stage, the crowd burst into synchronized cheers and jitters that reverberated throughout the entire room. Growing up, life wasn’t a breeze for Guerrero and she expanded upon her life’s adversity in the opening portion of her discussion. Since her parents were undocumented, her family lived each day in constant fear of being fragmented by an unfair system of justice. She found solace in the fact that her family and community were a tightly knit group who remained strong in the face of hardship. When she was 14 years old, Guerrero was accepted into the Boston Arts Academy where she pursued lofty dreams of working in the entertainment industry. She dedicated herself to the arts and theater and, after awhile, things seemed to be looking up. That is until one day she came home to an empty house. It turned out that two faulty lawyers that Guerrero’s parents had been working with to sort out their citizenship status were also siphoning their money. Adding insult to injury, the lawyers then reported her parents to the authorities. Her parents and brother were deported back to Colombia. Guerrero looked to her neighbors for a home to supplement the one she had lost so suddenly. “I went into survival mode and continued to go to school,” Guerrero professed. School was a safe haven for Guerrero that allowed her to exist in a world where she didn’t have to think about the harsh realities of law and order. After getting help from a guidance counselor, she strengthened her resolve to move forward and finish school. “It all came down to two things: Fear and the lack of education. I knew I had to continue on with my education,” Guerrero revealed. It all came down to two things: Fear and the lack of education. I knew I had to continue on with my education. In her mind, if she had the knowledge and ability to fight the wonky immigration systems in place, she would be one step closer to being able to help her parents and brother. After graduating high school, she began attending Regis College in Boston, Massachusetts where she majored in communications. In college she found it hard to find footing because, despite fueling herself with knowledge and resources, she wanted to represent something of higher value than purely academics. 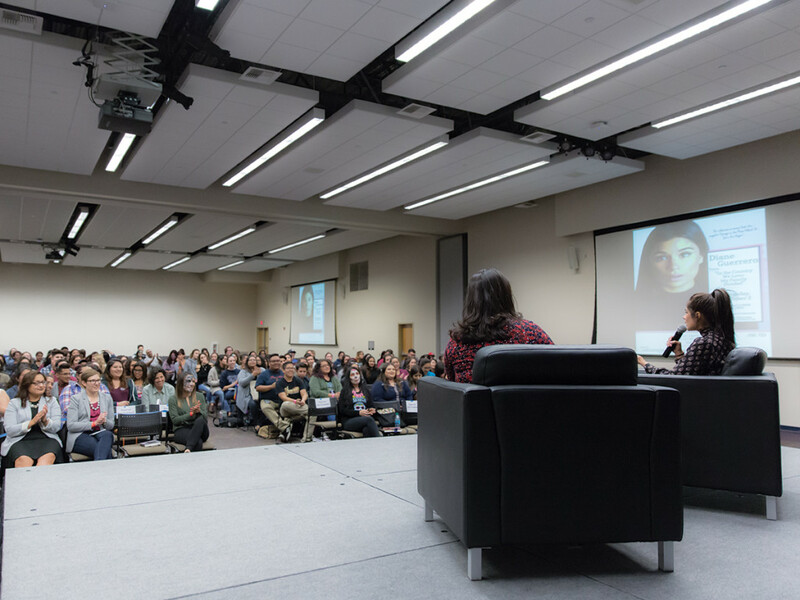 “I still wasn’t that comfortable with reading and writing, I wanted to rally behind a cause,” Guerrero said as she spoke on the brief period of uncertainty after college. After crying her eyes out to a stranger about not being completely satisfied with college and wanting to fulfill something substantial, she came to the striking revelation that she had a significant story to tell. One that would invoke much conversation and give her a possible platform to help others in need. She wrote an Op-Ed story for the LA Times, which received rave reactions from many and even got the attention of President Obama. “I thought, ‘Wow the conservatives are going to hate me.’ I’m glad I don’t care about that anymore,” Guerrero remarked, as she discussed the initial phase of fear before writing her piece. Guerrero was invited to the White House to watch Obama’s primetime address speech in November of 2014. 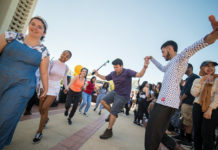 She expressed optimism in the potential for progressive gains with Obama’s Deferred Action for Childhood Arrivals program, which mandates that undocumented parents who have legal children be given a temporary pass to continue their lives in the United States. At the event, she got to privately meet with Obama, an encounter in which he told her that she “belonged here.” These words from Obama heightened Guerrero’s ambitions as an activist. Guerrero used this story to segue into a call of action for university students. She wanted everyone in the room to understand that we have a purpose in this lifetime, whether we are aware of it or not. “As college students you guys are already in a great place. This generation is equipped with tools like the internet which already gives you guys access to a lot more information than when I was younger. We need to be able to exert our influence on our community in order to make a (positive) change,” Guerrero asserted. She smiled at the faces of dozens of individuals in the crowd, many of whom were people of color. “We can’t fall asleep at the wheel. We need to share our stories and be empathetic of others. The Black Lives Matter movement is our movement. The LGBT movement is our movement. We’re all responsible for each other,” Guerrero addressed to the crowd. People snapped and whistled in response. She closed the event by thanking everyone for being present at her discussion. Her book was available for purchase and signing at the event. As soon as the coordinators motioned for people to form a line for the signing, people hopped out of their seats and rushed over to the east side of the room, forming more of a bloated trail of about 150 college students who all had their personal reasons for wanting to meet Guerrero. People had the opportunity to fill out a sheet that would then be given to Guerrero so she could have a script of what to sign as people waited patiently in line. After having a one-on-one with her myself, I can attest to the fact that she is a very sweet person who is truly grounded in reality, in spite of her celebrity status. After babbling like a fool, and thanking her for her lovely speech, I walked away a little bit happier with the day I’d just had. Diane Guerrero turned her pit of loss into a progressive dream of change. It was poetic justice that someone from such troubled beginnings could move a crowd of people with one sincere talk.